I've been in a rut as far as feeding my family goes. Especially lately, as I've drastically cut my food budget to pay for medical expenses. 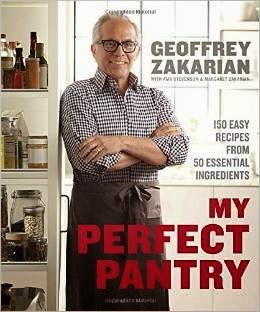 My Perfect Pantry by Geoffrey Zakarian sounded like it could give me a boost. You know, some celebrity chef talking about the 50 "essential" items for your pantry, and giving three recipes showcasing each of those ingredients? Sounds right up my alley. Well, except for the fact that I don't really care anything about "celebrity chefs" and have never heard of this guy. Apparently lots of folks have though. I love that there are photos of every recipe. I loved reading through the ingredients, with the discussion of why it should be a staple. Those were fascinating. I loved many of the recipes too. Especially since, for the most part, this isn't using totally wacky ingredients. Aside from the meat and some of the produce, most of the time, I do have the ingredients in my house already. The recipes are pretty straight-forward to follow, and the results are pretty fabulous. Some of the ideas for using some of the staples are really intriguing too. This isn't going to become one of my go-to cookbooks though, because it is arranged by ingredient, and that doesn't always make a lot of sense to me. Like a very good recipe for Clam Chowder, which you can find in the Chicken Stock section. That is not where I would look for it. If I was a Food Network fan, I'd probably be a lot more excited about this. Looks like an interesting cookbook, but I'm with you - I wouldn't think to look things up by ingredient. Especially if those ingredients aren't what come to mind as being in a specific dish. Maybe I'll see if our library has it :).